The ultimate Good Samaritan in an unassuming small Maine town, Huck is featured holding his book of good deeds and perched on a gas pump base from the 78 Station where he works when he’s not saving the day in ways big and small. Huck stands 8 inches tall and is designed by Rafael Albuquerque and studio head Israel Skelton, with sculpting from Tony Cipriano. 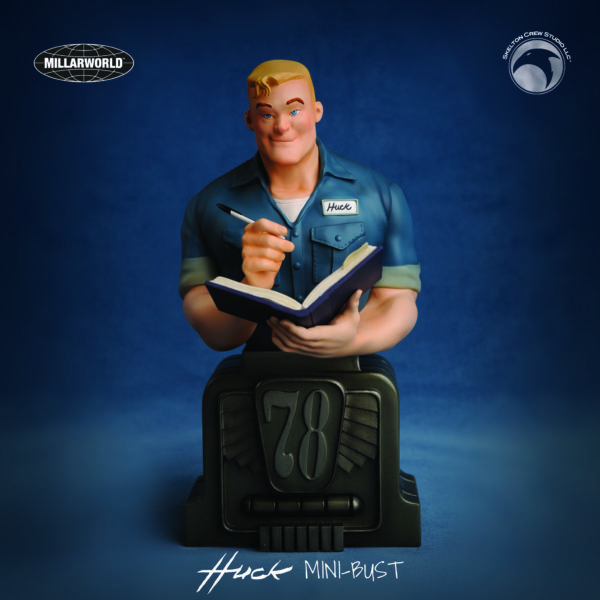 The Limited Edition Huck mini-bust is available for pre-order through February 14th at www.skeltoncrewstudio.com and as a sweet bonus, the first 100 orders will receive a “Please Love Him” handwritten note from Rafael Albuquerque — the same note Huck’s discovered with as a baby — signed by both Albuquerque and Mark Millar.